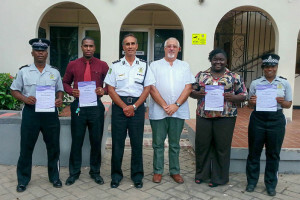 Eight officers of the Royal Virgin Islands Police Force including one member of its support staff completed the first half of a certificate course to become qualified swimming instructors. The RVIPF took advantage of the two-part programme led by former Olympian Brian Brinkley and supported by the Premier’s Office and BVI Swimming Foundation. The course is provided free-of-charge under the conditions that graduates volunteer to teach children to swim. “BVI Swimming Foundation recognised the need for certified swimming instructors that are able to teach children to swim in the Territory. The course is free of cost however students are expected to repay the course fee by volunteering to teach children to swim. All that students must pay is an assessment fee,” Brinkley notes. The two-time Olympian, who has been delivering the course in the U.K. for last 35 years, says that graduates of both the Level 1 and Level 2 courses receive an instructor’s certificate that is recognized worldwide. Commissioner of Police David Morris says he is delighted that officers on the Force took advantage of the course. “With certified swimming instructors on staff, the Force is able to teach not only new recruits and but provide training to those within the force who need to be proficient swimmers as well as children in our communities who want to learn to swim,” he said. The Level 1 course introduces the fundamentals and principles of coaching the sport as well as planning, teaching and evaluating coaching activities. The Level 2 course provides the necessary course work for the full award with a mixture of theory and practical.